Earlier today my colleague MG Siegler wrote about EightBit, a new social game and included the above video, with plenty of demo screencasts of the EightBit app. Those screencasts were via Sound Stage 1.3 for Mac, a desktop app that in addition to recording HD desktop screencaps, hooks into an iOS simulator to take screen captures of iPhone app demos. The app launched its new revamp yesterday and is currently the #1 developer tool in the Mac App Store, just breaking into the top 100 paid apps. 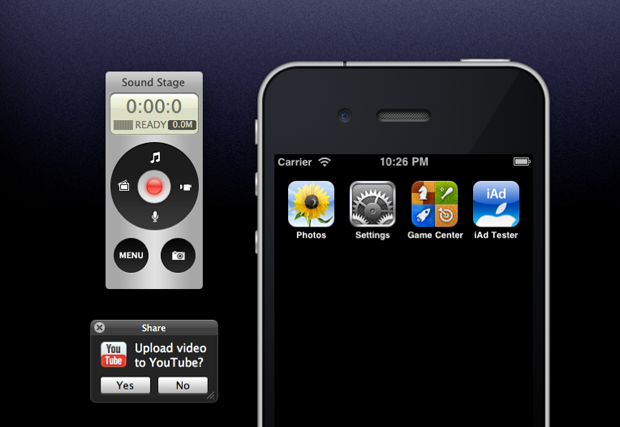 Along with its basic functions, it allows you to customize backgrounds and directly upload your videos to YouTube. Sound Stage interface designer Kevin Milden hopes that one day people will be viewing “app trailers” before they take the plunge to buy. The most amazing thing about the app, aside from how intuitive it is to actually use, is that it costs $4.99 in the Mac App store as opposed to $29.95 for the bare bones version of competitor IShowUHD, or $69 for Snapz Pro X. Also notable: This is the first time anything in the Mac App Store has caught my attention.